All the signs of spring are fast appearing: spring bulbs are forming carpets of colour by the roadsides, the daffodils are fast appearing, and BBC2’s Gardeners’ World starts its new series tonight – and there’s no more reliable sign than that! I find springtime one of the most exciting times of the year, not only because it means lighter evenings, longer days and the first real warmth in the sun, but because I enjoy seeing the many vibrant stages that gardens go through before they settle into a more sedate pace over the summer. 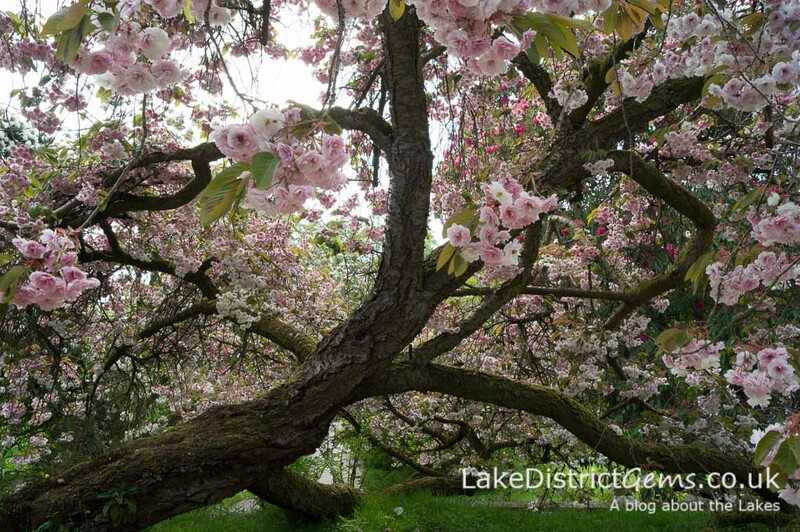 Some of the Lake District’s gardens really are at their best in the spring, so if you’re planning a visit, hopefully the following suggestions will help you fit in some garden visits while you’re here. Just bear in mind though that the seasons and growing conditions do vary each year, so the best times for colour in a previous year might not be an accurate guide for what to expect this time round! 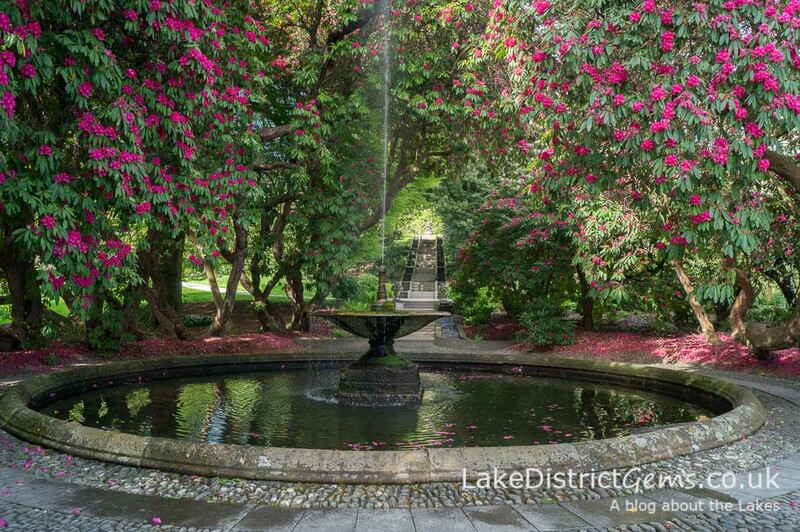 The 25 acres of formal and informal gardens at Holker Hall are beautiful at any time of year, but spring is when they really come into their own. I visited in mid-May, at which point the enormous rhododendrons were in full flower (especially important if you want to see the iconic Neptune Cascade at its best, but there are rhododendrons are in flower all around the grounds), as were the tulips in the formal Summer Garden. I’d say that I just caught the tulips before they went over. Bluebells carpeted the lush, green woodland areas, there were spring bulbs in the vast grass amphitheatre, and the blossom was at its best, literally covering enormous, gnarled trees that look as historic as the house! 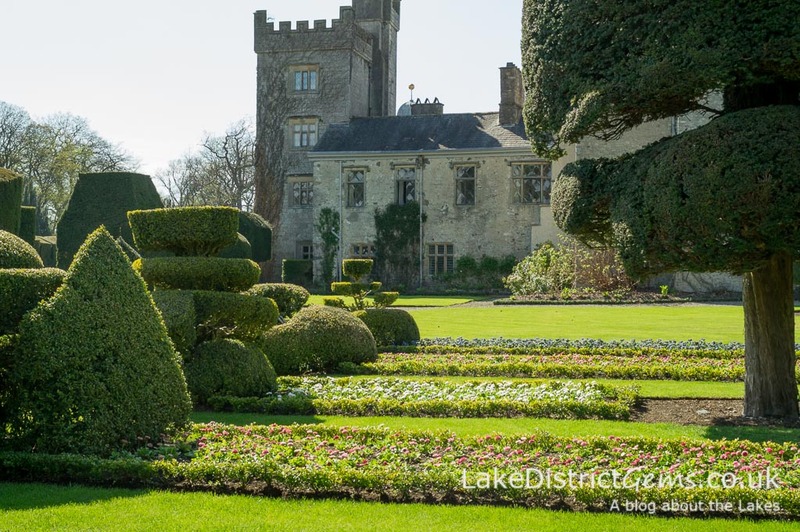 I wrote a more detailed post just after my visit, so you can see further spring pictures and find out more about the gardens at Holker Hall here. 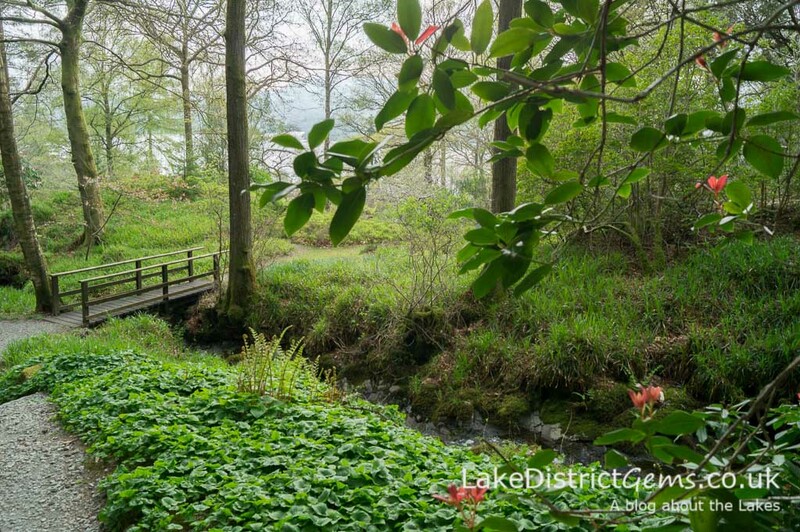 Stagshaw Gardens at Waterhead, just outside Ambleside, is a little-known and secluded eight-acre natural woodland garden belonging to the National Trust. 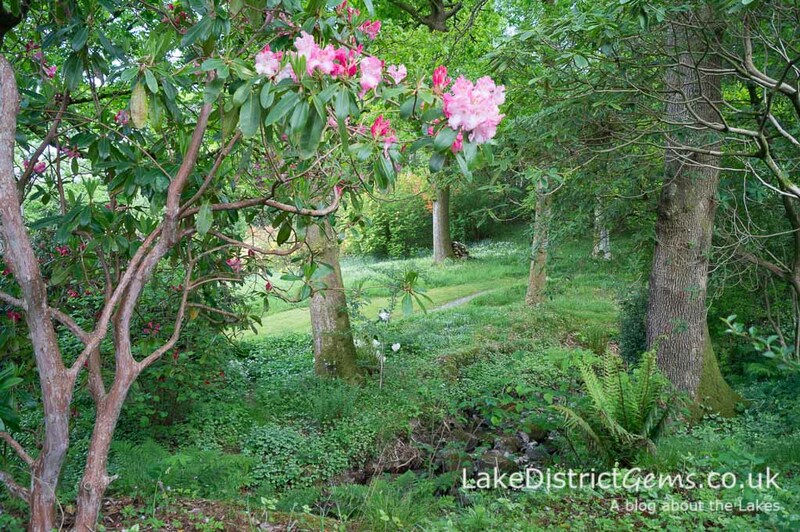 It was created by a former land agent who lived at the cottages below the garden, and he planted it with rhododendrons, camellias and azaleas, which have continued to flower in the springtime ever since. Considering how sheltered you would think this garden to be, I timed my first visit here too early (7 May), just as things were barely starting. The benefit of this is that you can see through the trees before they put on their full leaf growth, but there was little colour. I wrote about my early visit to the garden here. Fast forward to 24 May, and it was like visiting a different place! 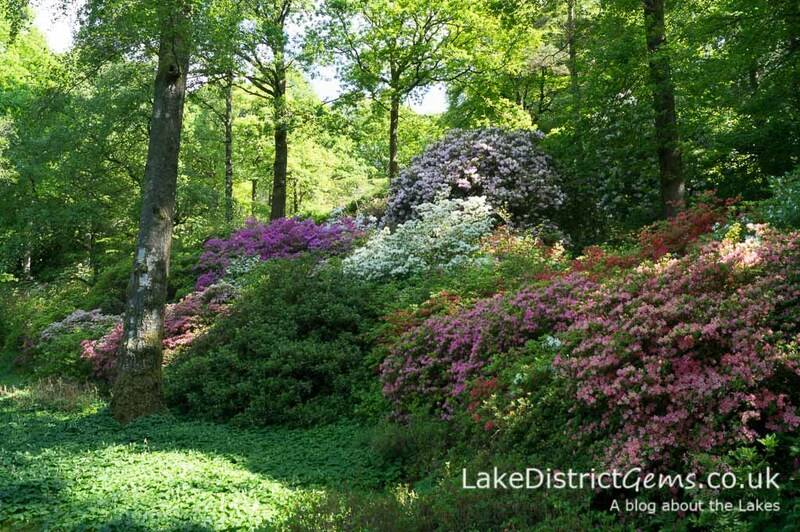 The trees had filled the gardens with shade, and the colours and smells (particularly on a path through the azaleas) were outstanding – amazingly there were still some rhododendrons waiting in bud! For a look at all the photos I took second time around, take a look at my later picture post. 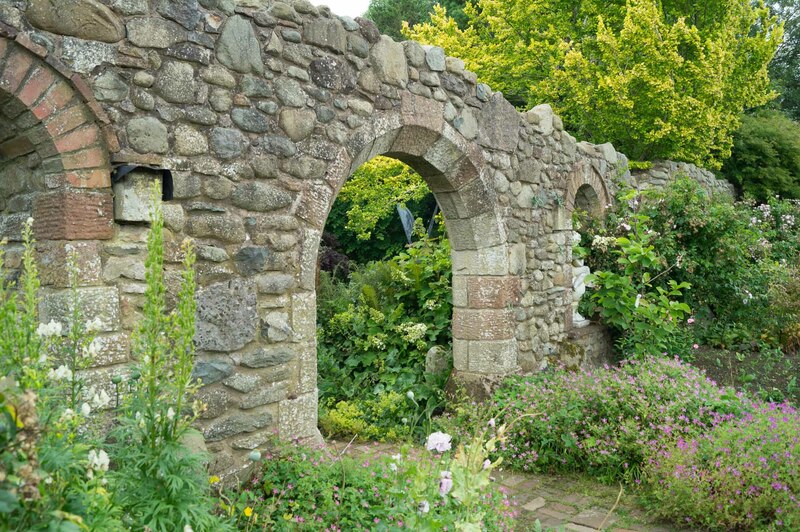 To be honest with you, I haven’t visited Muncaster Castle’s gardens for myself yet (well, I was taken there as a small child, but my memories only stretch to a piece of walled garden, some owls and an orange-coloured lollipop – I never forget a detail when it comes to food! ), but from all the things I’ve heard, spring is definitely the time to visit. I’ve seen the castle photographed with beautiful carpets of daffodils and bluebells in the foreground and, according to Muncaster, its bluebell woods are among the best in the country. Muncaster is also apparently home to what was ‘at one time, considered to be the largest collection of species rhododendrons in Europe’. A visit is recommended from March onwards, but from the Twittersphere I suspect that April and May are the best times to see the colours. Larch Cottage Nurseries, a garden nursery in Melkinthorpe near Penrith, has such huge character that it can’t fail to please, whatever time of year you visit. Apparently it looks a picture of purple during the allium season, and because these are amongst my favourite flowers, it’s on my list of spring places to visit. Here’s a post I wrote about Larch Cottage later in the year. 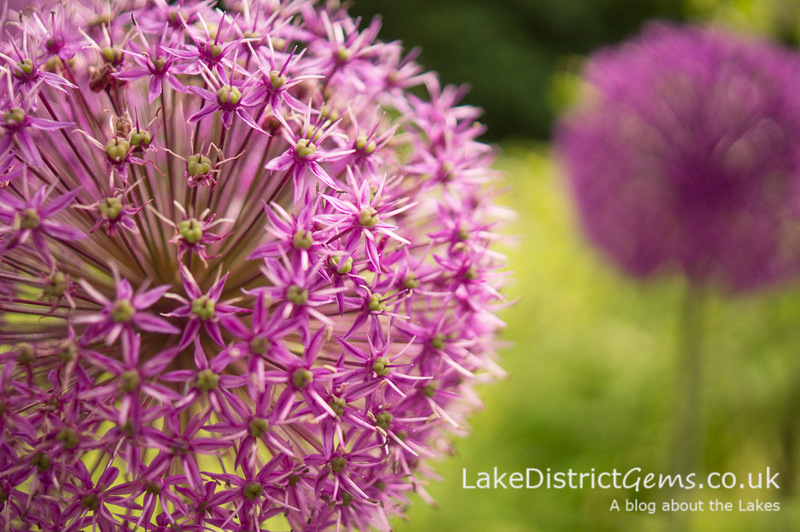 The allium: pure purple fun! Holehird is one of those places that’s worth visiting throughout the year because there’s something for every season. Much of the garden is still dormant in the early spring, but there are cheerful displays of daffodils everywhere, and you get to enjoy the views at their very best before the leaves come out on the trees. Here’s a post about Holehird throughout the year. 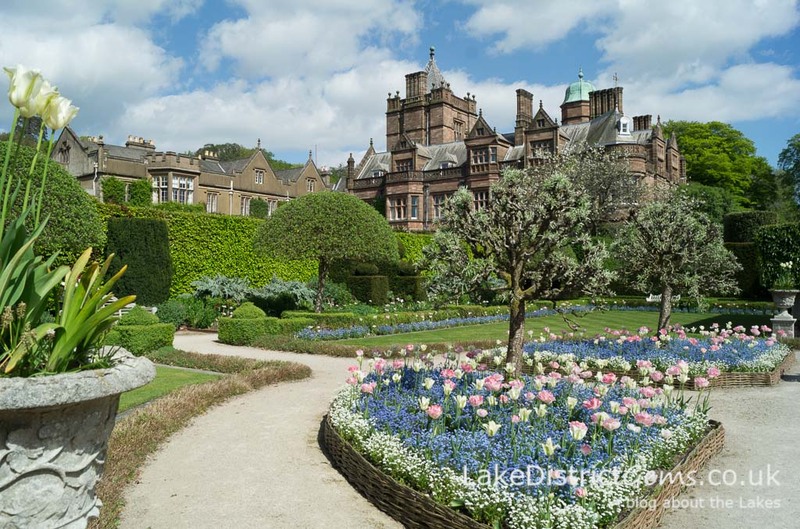 The National Garden Scheme (NGS) is celebrating its 90th year of raising funds for charity, and Cumbria NGS has just revealed its 2017 calendar of private and commercial open gardens. 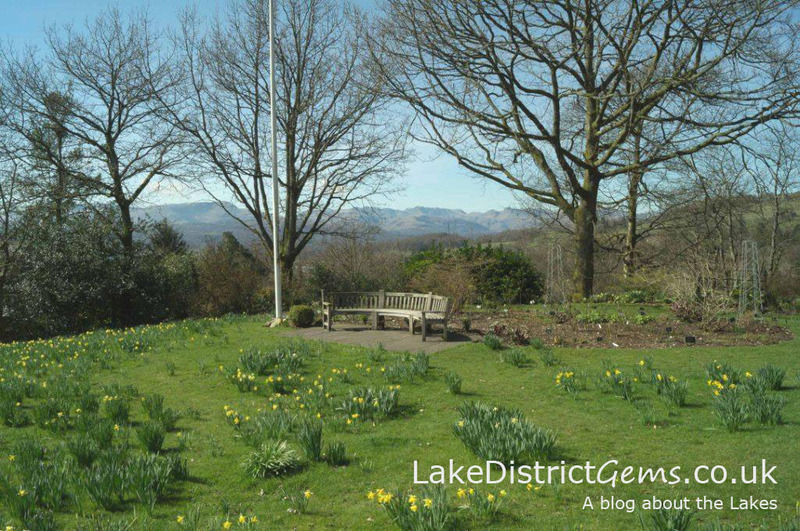 You can pick up a free copy of the Cumbria NGS booklet at leaflet stands across the Lake District, or search by date and location on the NGS website. The gardens tend to open when they’re at their best, so hopefully you’ll find something of interest which you wouldn’t normally expect to see. 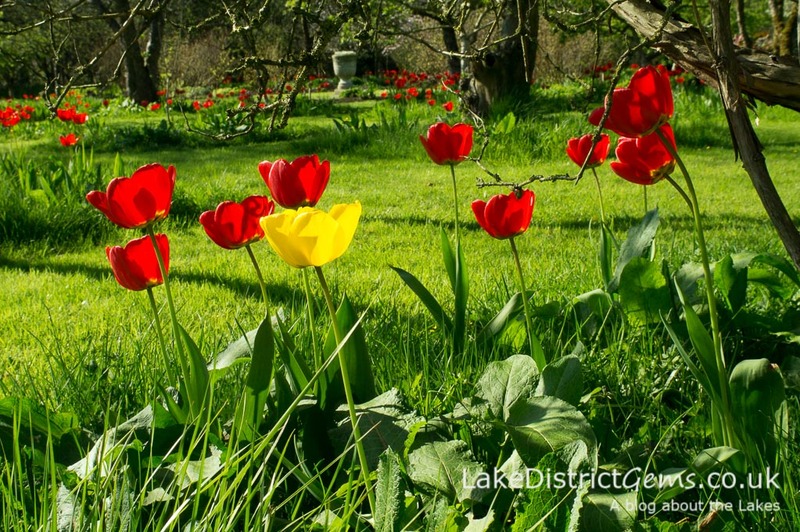 Have I missed a good spring garden somewhere in the Lake District? Please do let me know (and share your thoughts with other readers) by leaving a comment below! 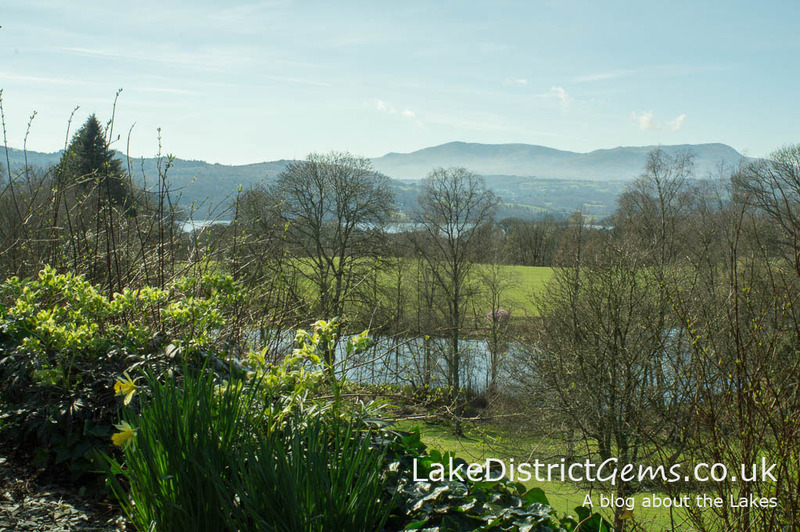 If you capture any photographs of gardens around the Lake District this spring, I’d love to see them on social media – I’m on Facebook, Twitter and Instagram, so don’t forget to tag me or post on the Lake District Gems Facebook page!